Last month, I had the privilege of going to Israel, Egypt, and Jordan with my students and friends. For me, one of the most dreaded events of the whole trip was the climbing Mount Sinai due to my fear of heights and my fear of riding a camel. Due to health reasons, some people stayed at the bottom of the mountain, while a few of the young people climbed from the bottom to the top of Mount Sinai. However, the majority of us rode camels to the midpoint and then climbed up on foot. Since I was one of the leaders of the group, I felt it would not be right to stay behind and let others go up on their own, so I gathered up my courage “like a lamb going to be slaughtered” and rode the camel. At first, the camel seemed like an alien to me. It was bigger and taller than I expected. While I was riding on its back, it suddenly stood up, and I felt like I was being lifted up so high that I couldn’t help but scream for my life. It was a moment mixed with embarrassment, fear, losing control, and perhaps a little too much excitement. After a while, I got used to riding the camel and gradually I started to like the experience. It wasn’t so bad after all. 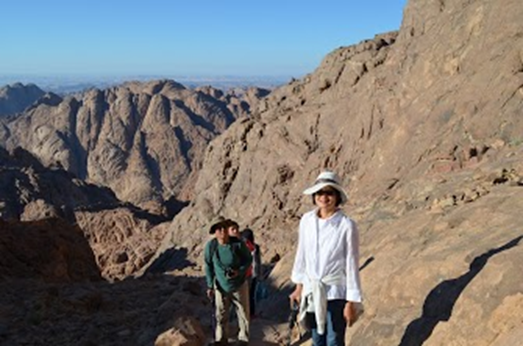 After we arrived at the camel station, I wasn’t prepared to climb to the top of Mount Sinai due to my fear of heights. However, most of the people were going up and I had just shared a devotional that morning about the top of Mount Sinai as the Holy of Holies where God met Moses. How could I “chicken out” by staying behind? I wanted to meet God. I wanted to experience what Moses experienced. So for the sake of the group and for the sake of myself, I climbed. At the end, I made it, along with 25 other teammates. Those who know me were surprised to see me at the top of Mount Sinai, but mostly, I surprised myself. Fear can cripple us from achieving our potential. Courage is not action without fear but action despite fear. One thing that calmed my fear during the trip was seeing the marvelous sight of Mount Sinai — a display of God’s wonder and beauty. Everything faded in comparison, including my fears. Sometimes, it is for the sake of other people that motivates us to do things beyond our abilities. We keep going not because we want to prove to ourselves that we can but to sustain hope among the teammates. People are at different stages of life. Some are not able to climb, while others are not able to ride the camels. Some choose to climb from the bottom to the top of the mountain. Some ride the camel and then climb on foot. Those who climb to the top should not look down on those who cannot. It takes courage to climb up. It also takes courage to acknowledge one’s physical weakness. Ascending up the mountain is like an act of worship. However, physical ascent may not reflect one’s spiritual ascent. Only God knows what is truly in one’s heart. Thanks for sharing. It would be great to meet you some time. I’ll be in SF for the Fullness in Christ Fellowship Conference Nov 1-3. Cecilia Yau, Lily Lee and Dora Wong are the founders of FICF. Could I invite you to come and bring some of your students? If I could ask for your email, I’d be happy to send you details. Chloe, I’m working on examples of courage for a message! I would love to quote you. Would you give permission – courage is action without fear, action despite fear. That is so perfect. Praising God for you and your ongoing growth is God’s ways. So proud of you! Sure, you are welcome to use it as an example. Thanks for the response and the encouragement!